This brilliant story tells the tale of Ogami Itto, the Royal Executioner for the Royal Court who is stripped of his title when falsely accused of treason by a rival faction. Paying the ultimate price for this falsehood, his wife is murdered and Ogami gathers up his son Daigoro, still a baby, to take their vengeance on the Yagyu clan who have made all this happen. 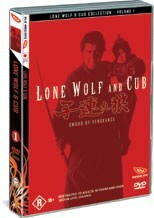 Originally filmed in 1972, I remember seeing Lone Wolf and cub at one stage or another and when I heard that this was coming to DVD I was very keen to add it to the collection. Ogami is a brilliant character, played skilfully by Tomisaburo Wakayama, full of intricacies and opposites, his rage directed at the Yagyu assassins is a polar opposite to the obvious love that he displays toward Daigoro (Akihiro Tomikawa). The turn in events forces the Lone Wolf to interact with people with whom a Royal Samurai would have no dealings with in his past life, allowing us to see his reaction to them and the way that the other side live. Whilst light on the extras which was a shame, Lone Wolf and Cub Vol. 1 is a must see experience, especially with this new transfer which has come up magnificently. Rated R, the show almost warrants this rating on occasion but for the overall storytelling experience, it’s well worth it. In my opinion an MA would have done it just fine.